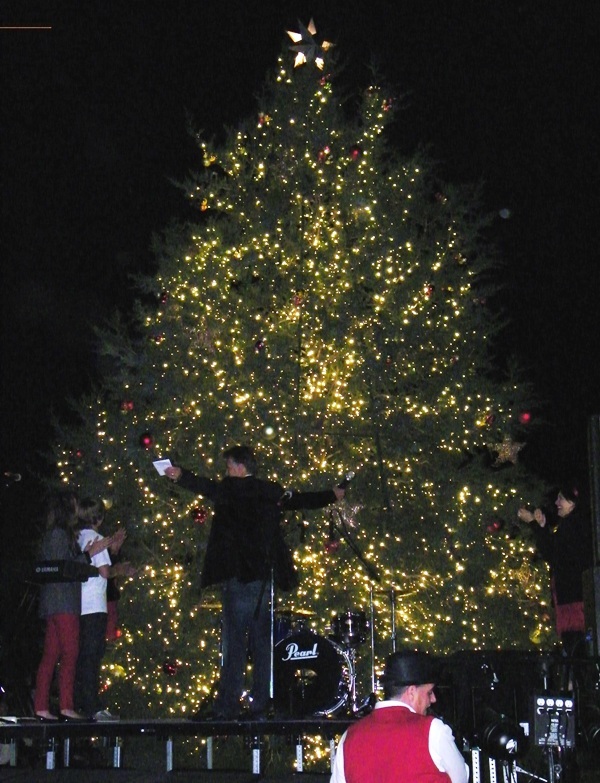 Mayor Brian Loughmiller presents the community tree! 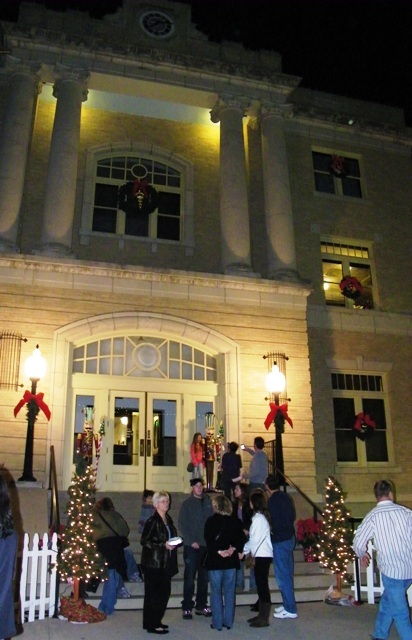 Christmastime is indeed here and in full-swing in McKinney, Texas. The halls (street lights and windows, too) have been decked with boughs of holly, strings of lights, and all sorts of sparkly silver and gold finery, and now we get on with the action of celebrating this joyous time of year. And if you haven’t yet seen the community tree in Mitchell Park at the entrance to downtown McKinney, we suggest you go see it at night – it’s gorgeous! 38th Annual Holiday Tour of Homes: This event kicks off the month on Saturday-Sunday, Dec. 3-4, presented by Chestnut Square Historic Village and the Heritage Guild of Collin County. Proceeds from the admission and raffle ticket sales are earmarked for maintenance costs on the historic buildings and grounds in the village. An antique Victorian table, valued at $400. Christmas Parade of Lights: (SCHEDULE CHANGE DUE TO WEATHER!) On the evening of Saturday, Dec. 10 (6:30 p.m.), McKinney will be filled with thousands (dare we say millions?) of lights as the “Star Spangled Christmas” themed parade rolls through the historic downtown square. Rotary Club of McKinney presents this annual event when individuals and groups ride in cars, pull floats, push strollers and pull wagons, all adorned in lights and wearing costumes. Bring the blankets, hot chocolate and your holiday spirit for a down-home great time for the whole family. Take a carriage ride with Happy Trails Carriage Services. 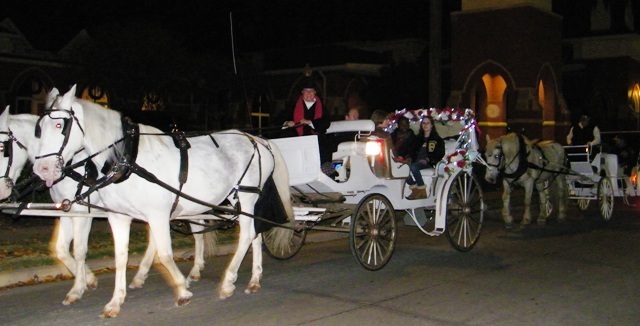 Holiday Carriage Rides: All month long (Dec. 3-31), you and your family can enjoy a carriage ride through the decorated historic district with Shannon and her team of horses from Happy Trails Carriage Service. They even provide the blankets and music! Reservations are required at happycarriage@peoplepc.com or by calling 214-662-6705. A Christmas Carol: The McKinney Repertory Theatre presents three more shows of their annual Christmas performance at the McKinney Performing Arts Center. Friday and Saturday shows are at 7:30 p.m. with a Sunday matinee at 2 p.m. Tickets are available by calling 214-544-4630 or by clicking on the link above. Annie the Musical: The “sun will come out tomorrow” over at the Heard-Craig Performance Hall (306 N. Church) when the McKinney Youth Theatre performs one of the world’s best loved musicals on Dec. 2-4 and again on Dec. 9-11. “My Country, My Christmas” – Gary Morris in Concert: The McKinney Performing Arts Center presents country recording artist and Broadway star (Valjean in “Les Miserables”) Gary Morris on Dec. 9. Tickets are $35 and you can buy them at the link above. 111 N. Tennessee. Christmas Donation Drive Party: Lone Star Wine Cellars hosts a free event to wrap-up their supply drive for McKinney’s Community Lifeline Center. Entertainment by Crystal Yates and John Griffith. 103 E. Virginia, 972-547-WINE. Inaugural Christmas Concert featuring the Texas Boys Choir at Adriatica’s Bella Donna Chapel, 401 Adriatic Parkway. Doors open at Friday, Dec. 9, at 7 p.m.; performance starts at 8 p.m. Seating is limited, so call to RSVP (817-924-1482) or buy tickets ahead of time at www.TexasBoysChoir.org for $25 each. A Night of Christmas Jazz featuring jazz combo trumpeter Thaddeus James Ford, violinist Richmond Punch, and tenor Daman Clark, at Mgroup Studio in the historic Cotton Mill. Friday (Dec. 9) at 7:30 p.m., $12; 972-547-4416. Breakfast With Santa – All Aboard the Polar Express! : This annual Parks, Recreation & Open Space event (Dec. 10) is by reservation only at the McKinney Community Center and fills up very quickly. Call 972-547-2690. THIS EVENT IS FULL; no more reservations being accepted. Holiday Trail of Lights at the Heard Museum: Bundle up your family, get out of the house, and experience the most unique holiday lighting display in North Texas (Dec. 17-19)! Tickets are available by clicking on the link above or by calling 972-562-5566. From 6:30-9 p.m. all three evenings. Santa Photos: Entertainment Photos offers photos with Santa. For schedule and reservations, the link. Through Dec. 23, and by appointment only. Candlelight Shopping in historic downtown McKinney shops displaying a candle in their window, Saturday nights in McKinney until Christmas. Participating businesses will extend their hours to 8 p.m. (and in some cases, later) to accommodate shoppers. Scholastic Book Fair at the McKinney Community Center, 2001 S. Central Expressway (Dec. 7-8). All books are 50% off the usual ticket price. Old Red Lumberyard Antique & Vintage Sale, 600 E. Louisiana (Dec. 16-17). Call 972-542-8774 or check out their Facebook page at the link above. The Artist’s Loft in downtown McKinney is holding a holiday gift box making class on Friday, Dec. 9, among several other classes that same week, all of which could lead to great handmade Christmas gifts! Email debra@debralinker.com or call 972-345-6311 for more information. Sweet Art Bakery in the historic Flour Mill is holding a holiday cake decorating class on Dec. 13. Learn to cover a cake in fondant and decorate it to look like a holiday package. To register, call 469-563-9471. ← Countdown to Thanksgiving Weekend! We’re glad you enjoy our blog.